Class 2 materials shall be carbide solution treated by heating for the ambient temperature and holding at a sufficient time at a temperature at which the chromium carbide will go into solution and then cooling at a rate sufficient to prevent the precipitation of the carbide. Stain-hardening of austentic steels is the increase in strength and hardness that results from plastic deformation below the re crystallization temperature (cold work). This effect is produces in austentic stainless steels by reducing oversized bars or wire to the desired final size by cold drawing or other process. The degree of strain-hardening achievable in any alloy is limited by its strain-hardening characteristics. In addition, the amount of strain-hardening that can be produced is further limited by the variables of the process, such as the total amount of cross section reduction, die angle, and bar size. In large diameter bars, for example, plastic deformation will occur principally in the outer regions of the bar so the the increased strength and hardness due to strain-hardening is achieved predominantly near the surface of the bar. Therefore, the smaller the bar, the greater the penetration of the strain-hardening. 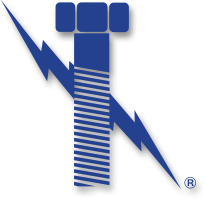 Why Lightning Bolt ASTM A193 Grade B8 Class 2 Stud Bolts?